Delta College won the Silicon Valley Bowl last year against De Anza College, which put the Mustangs football team on the board across the nation. “For me that game brought Joy,” said Recruiting and Assistant Head Coach Doug Murray. Defensive Coordinator Todd Herrington echoed the sentiment. “Winning the 2012 Silicon Valley Bowl was a fantastic accomplishment for our football team. It felt great to accomplish the goals of playing for a conference championship and go to a bowl game. Unfortunately we fell a little short of winning the conference championship,” Herrington said. The Mustangs are ranked ninth in state and moving from 18th to 16th place in the nation among top 25 junior colleges. Some members of last year’s winning team have transferred to four-year colleges to continue their love of the game. About twenty players are playing at four-year colleges as of right now. “We worked hard and it shared on game day. We played as a team and looked at one another as brothers. Even though we played one another in High School, I think the bond is what carried us that far,” said Kenneth Hanes, a 2012 Mustang who transferred to Briar Cliff University in Iowa. The 2013 season brought the return of about 30 players. Most of the players are local. The typical weekday for the team is broken down into three parts. At 7 a.m. the team trains with weights. The afternoon brings offense and defense meetings. Then from 3 p.m. to 6 p.m. the team practices at the field. The team took that preparation into last week’s game. 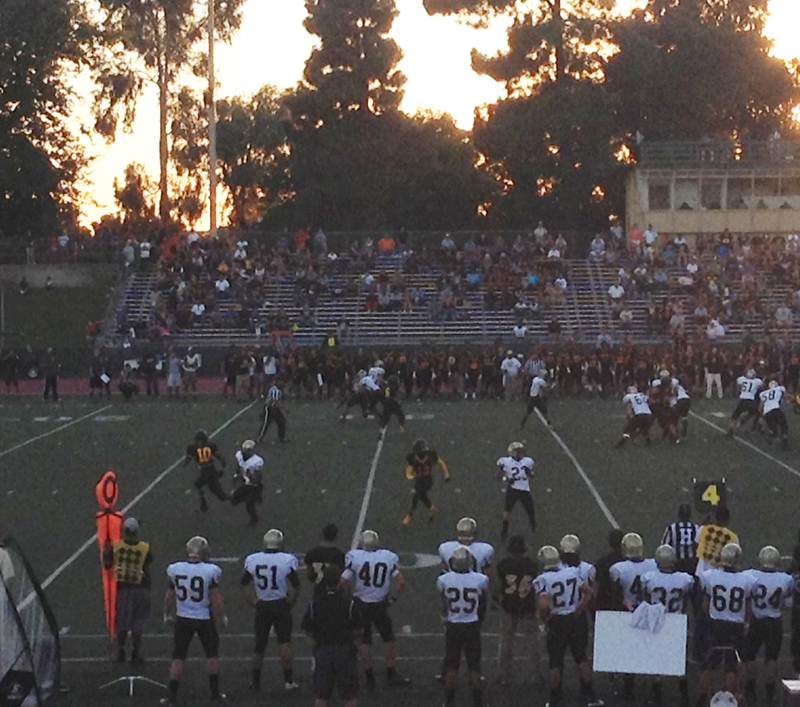 The Mustangs first game of the season against Chabot College was Saturday, Sept. 7. As the Mustangs stood in a straight line ready for the National Anthem to begin, so many thought of the game going through there heads. The weather is in the low 80s and a decent crowd of fans flanked both side of the Chabot field. The captains for the Mustangs are Cody Weinzheimer, Marcus Brown, Jamie Christopherson and John Singleton. Marcus Brown sacking the quarterback at the Mustangs goal giving Delta a two-point lead. The Mustangs starting quarterback of the game was Weinzheimer. In the second half Brian Golston gave the Mustangs the first touchdown of the season. Theo Wofford rushed for 175 yards against the Gladiators. Weinzheimer threw to William Mafi, who was knocked down at the one-yard line. Weinzheimer, who rushed for the one-yard touchdown gave the Mustangs a score of 17 points. The Mustangs defense kept fighting to the end, but fell short to the Gladiators 32-17. “I feel like my performance tonight was pretty good I know I got to fix something but I feel like I went forward. For improvement I just want to stay focus and keep playing to the best of my abilities,” said Brown, a member of the defensive line. The Mustangs now ready for this Saturday’s game against Reedley College. “We need to minimize mental mistakes and execute the responsibilities that each defensive position has. Reedley does a good job of spreading the ball vertically and horizontally on the field using talented athletes. All of our defenders will have to improve in defeating stock & cut blocks in the perimeter and tackling”, said Herrington. The Mustangs will take on Reedley College 1 p.m. on Saturday, Sept. 14 at DeRicco Football Stadium. This will be the team’s first opening home game.